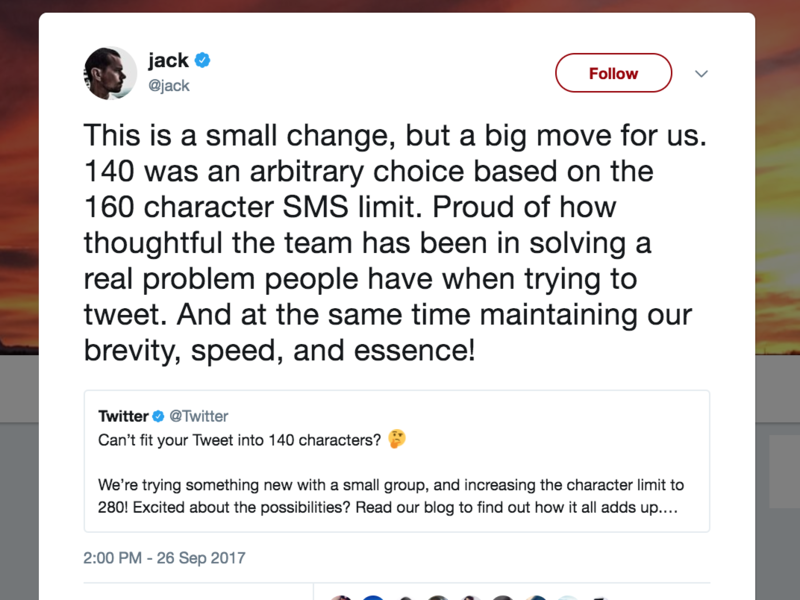 Twitter To Try Giving Users 280 Characters — Whether They Want Them Or Not : The Two-Way The company says it wants to give users more room to express themselves. But many users worry it will rob Twitter of its microblogging soul. Twitter co-founder Jack Dorsey demonstrated the platform's new 280-character tweets. But many users worry that longer posts will rob the service of its distinctive pithiness. Since the dawn of Twitter, the social network has been defined by its limit: 140 characters. But in a tweet that offered a glimpse of what is to come, co-founder Jack Dorsey announced that the service plans to experiment with doubling that cap. "This is a small change, but a big move for us. 140 was an arbitrary choice based on the 160 character SMS limit. Proud of how thoughtful the team has been in solving a real problem people have when trying to tweet. And at the same time maintaining our brevity, speed, and essence!" he wrote — all in one supersize tweet. But Dorsey's missive was emblematic of precisely what many Twitter users fear about a higher character limit: more words, less wit. Twitter says it's testing the 280-character limit with a small group of users — and that the limit will remain 140 characters in Japanese, Chinese and Korean. That is because tweets in those languages can already fit in a lot more information, as a single character might represent a noun. The company says it wants to relieve the pain of "cramming" — trying to squish your ideas into a single tweet, a process that can involve the painstaking rewriting of a tweet with increasingly fewer vowels. Twitter's character limit has led to two major workarounds: posting a screenshot of a longer text or starting a "thread" of related posts. Twitter says that 9 percent of tweets in English are exactly 140 characters; in Japanese, only 0.4 percent of tweets hit the limit. The company says hitting the limit is a major source of frustration for those tweeting in English. Twitter's research indicates that when people have more room to write, they tweet more — and that's exactly what the company needs. In July, Twitter reported that its U.S. monthly user base had declined to 68 million. Shortly after going public in 2013, the company's stock hit $69 a share. But it has been sliding since then as it struggles to make money; as of Wednesday afternoon, its shares were trading at around $17. As with other recent minor changes, users have complained that Twitter is making fixes they don't want and ignoring bigger issues. Me: I wish Twitter would ban all these idiot Nazis. Twitter: But how do you feel about VERBOSE Nazis? "I truly hope the company is spending as much time on combatting racism, harassment, and bots as it is on this. It doesn't seem like it," tweeted one user. "We are," replied co-founder Biz Stone. "Today we had everyone in the company join an @TwitterSafety all hands. We've made a lot of progress, but more work to be done." But there are real concerns that in raising the limit, the firehose that is Twitter will become overwhelming ... or more like Facebook — which might sound great to Twitter's executives. omg tweets are now long enough for signatures! Twitter "will try anything it can to tweak it so it becomes a magic revenue generation machine like Facebook," media commentator Dom Knight protests at The Guardian. "These efforts have bloated the platform so now there are 'moments', 'tweets you may have missed', the 'explore tab', and all the other 'features' that we addicts entirely ignore. But it's always going to be a niche platform: It delivers information overload, which is only enjoyable for some of us. It can't compete with Facebook, and shouldn't try." But maybe a Twitter with longer tweets won't be so bad. Daisuke Furuta, the editor of BuzzFeed Japan, has comforting words for tweeters nervous about a bloviated future. "[T]his is just how Twitter is in Japan, and we love it just as much as you do in the US," he writes. "And we have just as many hilarious memes, weird Twitter subcultures, and massive cultural moments based on tweets as you guys do." The more tweets change, the more tweets stay the same. "You'll love it," promises Furuta, "or at least you'll only hate it as much as you hate Twitter already."